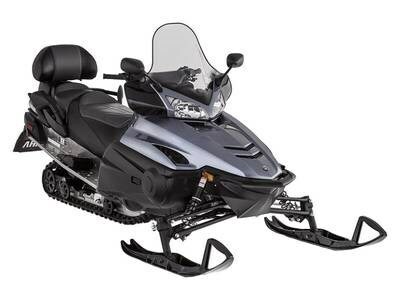 2018 Yamaha RS Venture CONQUER SNOW You and your passenger want a quality touring snowmobile that has a proven track record and an attractive sticker price. The RSVenture is your answer. The carbureted base model RSVenture has enjoyed a lengthy run by providing a quality touring model with all the features to provide your passenger with a comfortable ride. Look no further, your next snowmobile is here. 973CC GENESIS ENGINE — CARBURETED The "original" 973cc Genesis, 3-cylinder engine Foundation of 4-stroke snowmobiling Year-after-year dependability ENGINE BRAKING REDUCTION SYSTEM "Free-wheel' feeling on deceleration Allows small amount of air to flow through the intake system upon throttle release Dramatically reduces engine braking effect typically associated with 4-stroke engines DELUXE KING QUEEN SEAT Plush two-up seating with integrated backrest Grab bar with wind deflectors Footrest blocks Features may include: PERFORMANCE YVXC Clutching Featuring Yamaha drive and driven clutching, the YVXC system delivers smooth engagement, instant acceleration, fast reacting backshift, and cool operating temperatures for a long belt life. The YVXC clutch system delivers Yamaha's hallmark smooth power delivery, responsive engine feel and unmatched quality. Engine Braking Reduction System Yamaha utilizes an engine braking reduction system for a "free-wheel" feeling on deceleration. The system allows a small amount of air to flow through the intake system upon throttle release, thereby dramatically reducing the engine braking effect typically association with a four-stroke engine. HANDLING RipSaw II Track Regarded as the best high-performance terrain track available, the 151 x 1.25-inch lug design of the RipSaw II delivers incredible acceleration, braking control, and handling in a wide variety of conditions. Third Generation Front Suspension The sophisticated and precise design of the front suspension incorporates a motion geometry specifically calibrated to eliminate unwanted inside ski lift while cornering. The dual A-arm system is both precise and remarkably predictable for confidence inspiring performance in nearly any terrain.